Rhoda can now make jokes about being one of the few people around who have migraines but never has a headache. “People usually think I am joking anyway – it sounds impossible,” she laughs. But Rhoda’s journey to get proper treatment for her migraines has been an uphill struggle over the last couple of years and no laughing matter. “It all started when I had given birth to my second child. 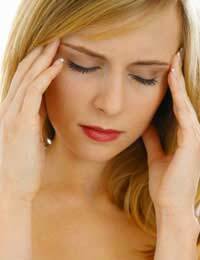 I have never really had headaches and certainly never a migraine. I never have had any head pain but I began to feel very strange, sometimes for two or three days at a time,” she explains. Rhoda’s symptoms included disturbances in her vision – flashing lights, not liking being near any bright light at all, an inability to focus properly and she felt dizzy and sick. “During one ‘attack’ I felt like my fingers were going numb and I had a vague ache in my right cheek and I found it difficult to talk – I just didn’t want to speak,” she says. When Rhoda’s husband returned from work, Rhoda had managed to put their two small children to bed but was still feeling very ill. “He took one look at me and decided that he was going to take me to hospital. He didn’t say at the time, but he thought I might have had a mild stroke – my face was floppy on the right side and when I tried to talk to him I was really making no sense,” says Rhoda. An emergency examination ruled out stroke and Rhoda was sent home to rest and the emergency physician recommended she go and she her GP and, if necessary a neurologist. Over the next year, Rhoda had a range of tests but none were really very conclusive. “The episodes of illness were now more frequent – sometimes every week and I was really feeling tired and worn out by it – and by having two small children to look after,” says Rhoda. The doctors tried to put the problem down to the stress of her current situation but Rhoda knew that it wasn’t that. “I wasn’t particularly stressed – I had given up work and I relished being at home, looking after the house and the children – I had planned to do this and it was going to be a really good time in my life. It was just the feeling ill that was causing the problems, not the other way around,” she says. Eventually, Rhoda saw a migraine specialist – no-one had suggested that she might have migraine before that but one of the neurologists she had seen had discussed her symptoms at a case conference at the hospital, and the migraine specialist was intrigued. “Apparently, he had recently seen a case of a woman with ‘silent migraine’ who had very similar symptoms and he was interested to examine me,” Rhoda explains. After taking a careful case history and having a long discussion with Rhoda, the specialist was more convinced that she did have silent migraine. But actually proving this was difficult. “He recommended that I try a standard treatment for migraines that are accompanied by severe head pain and see if this worked to reduce my symptoms for a month,” says Rhoda. This she did and was stunned by the results. “I was given a tablet to take if I felt like ‘an attack’ was coming on – apparently the premonitions that I was having were the same as a migraine aura. I also had a nasal spray that I took if I started to experience any skin tingling or numbness, face pain or nausea. I was amazed that doing this reduced to the attacks to a couple of hours rather than a couple of days,” she remembers. When Rhoda returned for her follow up appointment it was obvious that the specialist had been spot on. He recommended that Rhoda continue to take her migraine medication as she had been doing – and officially made a diagnosis of rare, but silent, migraine. I have the same thing. It started as a regular migraine. My doctor suggested it might have been caused by anticonception pills, so I stopped taking them. The pain part of the migraine faded away within the months to follow, but the rest of it is still here: the aura, the blurry vision, the speech problems.